The 7.3 Gallon Locking TouchTop™ is designed with a locking lid to keep children and pets out of the trash. Turning the locking knob counter clockwise will easily unlock the wastebasket. The entire lid will stay secured to the base even if the wastebasket is accidentally tipped or pushed over. When unlocked, a push of the TouchTop™ will release the spring-loaded, hinged lid to the open position for hands free trash disposal. The D-Shape profile fits neatly against a wall or cabinet making it the ideal solution for the office, craft room or bathroom. Accommodates a standard 8 gallon trash liner. Overall Assembled Size: 14 1/4" x 11 3/8" x 17 3/8"
Ideal for use in the bathroom or bedroom where pets could have easy access. 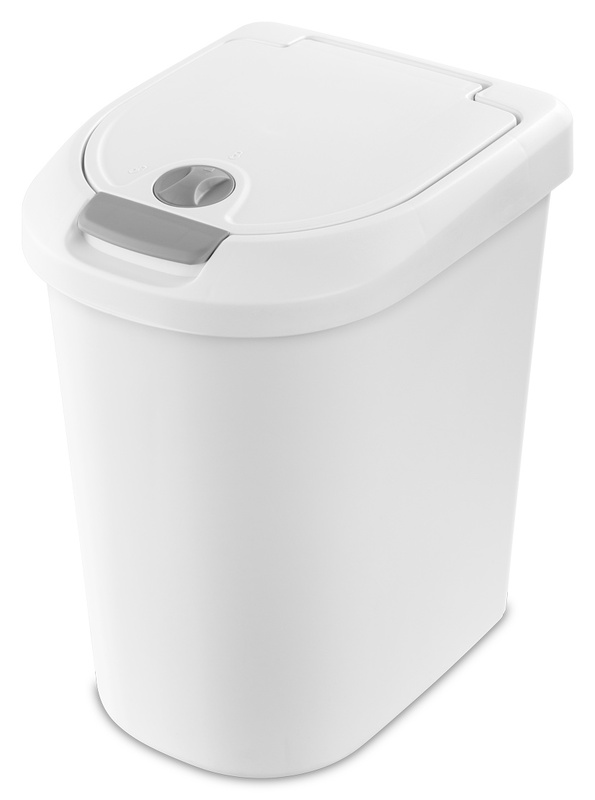 7.3 Gallon Locking TouchTop Wastebasket is rated 3.9 out of 5 by 7. Rated 2 out of 5 by dotcalm9 from Fine garbage can BUT... I have to keep replacing the entire garbage can every 5-6 months because the lock keeps breaking and the top won't stay closed. It is such bad design. I can't take it anymore. I assume it's the company's motive so you have to keep rebuying a garbage can that there's nothing wrong with. I've tried, oh how I've tried, just to buy another lid, but you can't. So I've given up. Switching brands. Rated 5 out of 5 by Faith from Great Recycle Bin I love this little trash bin! I have them in my pantry to sort recyclables and returnable cans. Rated 5 out of 5 by Hmm2525 from Great ro have with dogs Love the lid stays on and does not loose its shape. My dog can nock it over and the garbage stays in love it. Freat buy. 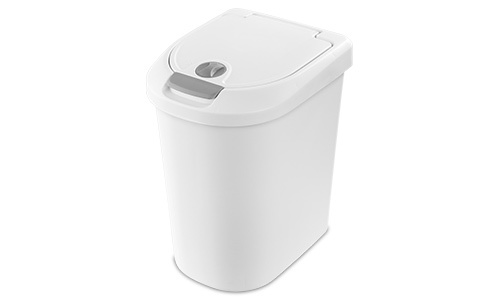 Rated 5 out of 5 by Marcia from Great Wastebasket Made by a Great Company I love using this wastebasket. I holds a reasonable amount of refuse before it needs to be emptied, plastic liner bags fit it well, and if it becomes spotted by careless users, it wipes clean very easily. Best of all, it is long-lasting, at least for us. Rated 4 out of 5 by Kelli from Good product backed by excellent customer service! 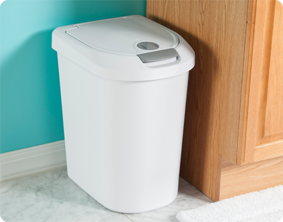 Our 7:5 gallon touchtop trash can fits perfectly in our bathroom and prevents our mischievous dog from “exploring” the trash inside. Our trash can lid fastener recently broke and I contacted Sterilite to inquire about a replacement part before spending money to replace an otherwise perfectly fine trash can. The representative was very courteous and mailed the replacement part free of charge. I would recommend this product based on the excellent customer service this company offered! Rated 1 out of 5 by Heather71 from broken: 2 for 2! I purchased two of these trash cans and both have broken latches with normal use! In one case the latch just broke off and the other just holds the top down and you have to pry the can open, it's very annoying. One broke within 2 months of purchase the other within a year. Rated 5 out of 5 by Cherry from Functions as advertised. Would get another immediately! Bought this to use in our travel trailer. Love the locking top for odor control and keeping dogs out. Spring loaded lid allows me to keep it open while prepping without constantly having to try to get it open. Size is not too big, but big enough and it fits nicely into corner, staying out of the way but accessible.